Massachusetts Conference for Women…and Farewell | JCALPRO, Inc. This past December the Boston Convention & Exhibition Center held the annual Massachusetts Conference for Women. As a woman in Massachusetts working in an office with four other women (and one Brendan) it seemed like a good topic to write about. The Mass Women’s Conference is an annual event where thousands of women come together to connect, network, build skills, and become motivated and inspired. This year there were three events, over 150 speakers, and 13,000 attendees. The ultimate goal set out by the Conference for Women is to emphasis the power and influence that women hold, not just in the workplace, but in society. They aim to bring together professionals in various fields to encourage the support and amplification of women’s professional roles. They are highly concerned about combating the issues of the gender pay gap, and gender discrimination in the workplace. Many successful speakers come to help with this encouragement. new and exciting speakers attend each year. Apparently, last year Meryl Streep was here and I missed her! However, we had equally exciting speakers this year including Aly Raisman and Amal Clooney. 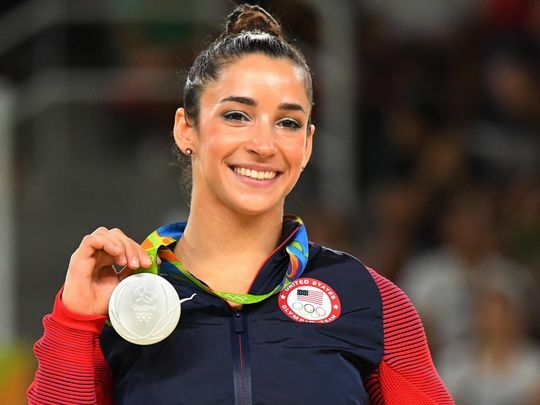 Aly Raisman was the captain of the US Olympic Women’s Gymnastics team in 2012 and 2016, which won gold both years. During the 2012 games she was the most decorated US gymnast, and is currently the second most decorated US gymnast of all-time, as well as being the first US gymnast to win gold on the floor exercise. She made all of these achievements and holds all of these titles which she made between the ages of 18-22. Truly an inspiration, she has gone on to fight against sexual abuse in the sport, and even wrote a book about her journey. She actively works to empower women by speaking on the issues of body image and self-confidence. Another truly amazing lady who inspires me as a woman is Amal Clooney. Many of you may know her as ‘George Clooney’s wife’. Amal is a Lebanese-British human rights lawyer who worked on the Enron case, completed a judicial clerkship at the International Court of Justice, worked as an adviser to Kofi Annan on Syria, as Counsel on the UN’s 2013 Drone Inquiry into the use of drones in counter-terrorism operations, represented the state of Cambodia, and was adviser to the King of Bahrain in regards to the Bahrain Independent Commission of Inquiry, just to name a few of her accolades. And this year, her husband, George Clooney received the 46th AFI Life Achievement Award… So that happened. I am mostly kidding, I know George is beloved and highly talented. However, I think it is safe to say he married up! All in all, I was incredibly honored to share my work building with this organisation, and the women both speaking and attending, and I am so glad that I got to witness this event before my time was up at JCALPRO. As for JCAL, if any of you are reading this, I want to say a huge thank you to all of you who accepted me into your workplace here and made me feel very much at home. I had so much fun and learned a lot about this company, and myself. Tina, Maria, Jen, Paige and Brendan, as well as all of the riggers (too many names to list in a short blog post, sorry! ), thank you all and I wish you all the very best. And with that, I bid you adieu! It has been my absolute pleasure to be here having a one-way conversation with my audience, all two of you, these past six months. I thank you for your attention to my work. I wish the best to the next co-op who will be taking over the task of monthly blogging (it’s really not that easy). © TEXT JCALPRO, Inc. All Rights Reserved.